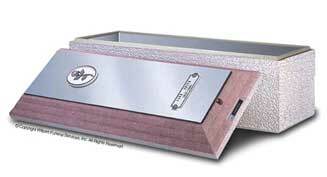 32oz bronze external overlay, high-strength structural concrete in base and cover, seamless ABS bonded plastic interior liner, with a 16 oz bronze internal liner. 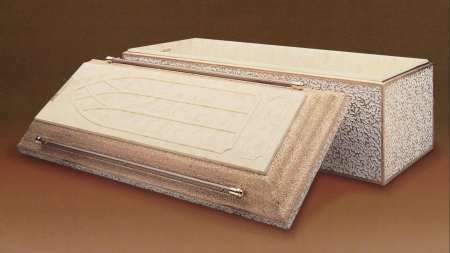 Thick-walled concrete base and cover, interior liners of ABS Trilon and solid bronze. Thick-walled concrete base and cover, interior liners of ABS Trilon and solid copper. Thick-walled concrete base and cover, interior liners of ABS Trilon and stainless steel. Thick-walled concrete base and cover, interior liners of ABS Trilion and stainless steel. High strength concrete with seamless bonded ABS plastic lining and exterior. High-strength concrete with seamless bonded, high-impact white Marbelon ABS plastic liner. High strength concrete with a Strentex plastic lining.